And before they buried them, they stuffed them with grass and moss, then wrapped them all up. That’s where the mummies come from, and women started making burial masks for them. Ceremonial masks were preserved in caves in the Aleutian Islands, including one on Unga Island where human burials and mummies were also placed. 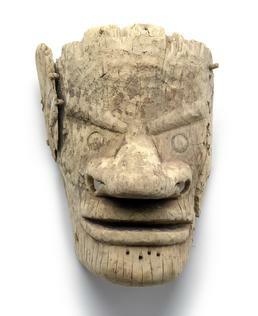 This large Unga mask still has traces of paint and holes where carved ornaments were once attached. Mary Bourdukofsky: The story I used to hear was that long ago, when they buried the chief—tuukg^uu [chief, leader] I always call it—of the village and the islands, they buried him with his things that he treasured and were sacred and put them in the cave where they put him after they mummified him. I think the rest of his things were handed down to the sons and their grandchildren and so on. Daria Dirks: Maybe they used some of the masks for ceremonial dancing. Mary Bourdukofsky: Yeah, they did. When he’s dancing, how did he see? The eyes are not—unless his eyes were here [nostrils]. How they kept it on their face? Aron Crowell: I think if it was worn for dancing, it would have to have some sort of brace. Some of them have a bar that you can plant in your teeth and a strap around the back. Daria Dirks: What kind of wood do we think this is? Vlass Shabolin: Cottonwood. Cottonwood is so soft you could cut into it like that. Mary Bourdukofsky: It’s driftwood. We don’t have trees, but there’s a lot of driftwood around the Island. Maria Turnpaugh: We get all kinds of driftwood. Aron Crowell: This might have been painted. You can still see little traces of red. Some of the masks from the cave showed more paint than this one. Daria Dirks: Doesn’t that [side of nose] look like green? Maria Turnpaugh: Looks like it might be stained, and under the lips there too. Aron Crowell: It’s likely that these holes around the sides were for attachments of different kinds. A lot of the pieces that were found in the cave are parts that stuck out around the mask. Mary Bourdukofsky: Sticking feathers and stuff in it, to decorate it. Aron Crowell: One thing I’m noticing is a piece that fell off was fixed with wooden pegs, I think while the mask was being made, because you even see the lines go right over the top of the pegs. Maybe the maker had to add some pieces to get it wide enough or something. 1. The description of mummification includes discussion of armor A017249. See A017249 for a longer discussion of this practice. Masks were worn during the elaborate “plays” or ceremonial performances that Aleutian Islands villages presented to invited guests from other settlements, accompanied by generous feasts and gift-giving that often left the hosts in a state of proud poverty and near-starvation. (1) In the chief’s communal house, masked performers enacted hunts, dramatic battles, and ancestral legends for the assembled guests, accompanied by drumming and songs. In other kinds of winter festivals, described by Solov’ev, Tolstykh, Levashev, Sarychev, and other Russian visitors during the latter half of the 1700s, masked men and women danced to the beat of drums and carried bladder-rattles made from inflated seal stomachs. (2) In celebration of obtaining a whale, Solov’ev—in the eastern Aleutians during 1764-65—wrote that “some of them dance naked in wooden masks, which reach down to their shoulders, and represent various sorts of sea-animals.”(3) Men and women dressed in beautifully decorated parkas, hats, belts, and intestine coats to attend and perform in the winter festivals. Traditionally, masks and drums were either destroyed or placed in caves, never to be used again. (9) Masks have been found in several Aleutian caves at Atka, Tigalda (see mask NMAI 75905), Kagamil, and most abundantly at Unga Island in the Shumagin group.